After 635 days, the Cleveland Browns finally won after upstaging the New York Jets 21-17 in the NFL, snapping a 19-game winless streak. Not since December 2016 had the Browns celebrated victory but that all changed on Thursday and all it took was the top overall draft pick, a running back with new motivation and a familiar call from the Philadelphia Eagles' playbook. 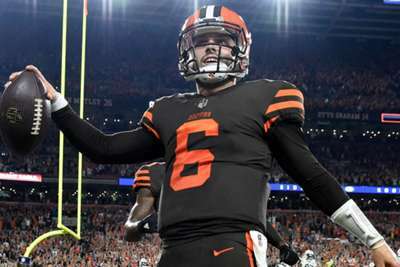 Baker Mayfield, who before the last two minutes of the first half was just a spectator, took over and gave new life to Cleveland, who rallied from a 14-0 deficit. He was helped by Carlos Hyde, who was not just celebrating his 28th birthday but soon the birth of his first child. The two later paired up for a momentum-changing play. The duo snuck into another team's playbook for a two-point conversion Mayfield later admitted "may or may not have been called the Philly Special." So, how did the rookie who had yet to have live reps with the first-team feel after the win? "I feel good," Mayfield said. "We finally put the pieces together a little bit. ... This crowd deserved to see this win at home and that's what I'm most proud of that we put it together for the fans at home." Mayfield made his impromptu NFL debut after starting quarterback Tyrod Taylor was ruled out with a concussion sustained late in the second quarter, and the rookie was immediately put to work. His first throw, a completion to Jarvis Landry for 14 yards, already outpaced Taylor's performance. The Browns had negative three net passing yards before Mayfield took over with less than two minutes until half. He strung together 11 plays that ended with a field goal for the team's first points. After the break, Cleveland put up points every quarter highlighted by two 69-plus yard touchdown drives — an impressive feat for someone who had yet to practice with the Browns' starters. "As corny as it sounds, that's kind of how my whole life has gone," Mayfield said. "I've had the backup role, had to fight through things and always had to be mentality ready and ready to go. I don't get the reps but that doesn't mean I don't have to know what's going on." He sure knew what was going on when he lined up under center. His entrance showed up every other quarterback who took the field. After three quarters, he had more passing yards than Sam Darnold and Taylor combined — 141 for Mayfield compared to 112 between the two other quarterbacks. Mayfield went 17-of-23 passing (including three drops) for 201 yards, no touchdowns and no interceptions. After a scoreless first quarter, Darnold – the third pick in the 2018 Draft – led two touchdown drives to give the Jets an early lead. One was his own doing, and the other was thanks to a blocked punt from New York special teams. The scoring drives showcased Darnold's ability to quickly get the ball out with a short pass on third and four to extend the first touchdown drive and another dart on third and 11 in the second, but after that he fell flat. It was not until midway through the fourth quarter with the score tied at 14 points apiece that Darnold came back to life. He was able to move the ball 65 yards to set up Jason Myers with an easy 28-yard field goal attempt to put the Jets back up. Darnold again took over, this time trailing the Browns for the first time. After a clutch fourth-down conversion, he threw a late pick to give the Browns possession with a little more than 1:20 left. The rookie, who was playing in his third game in 11 days, finally tired and finished 15-of-31 passing for 169 yards and two interceptions. Before the game, Hyde was rushing straight from the hospital. After the game, according to Mayfield, Hyde was rushing back to the hospital. It was a meaningful night for the first-year Browns running back, and it was not just because of the baby or his birthday. Hyde played a key role in Cleveland's win, scoring both touchdowns to first tie the game and then put the Browns up for good. He ended with 23 carries for 98 yards to trample on the Jets' defense, who allowed 323 total yards and is in the running for the best touchdown celebration of the night. After his first score, he cradled the ball like a baby.